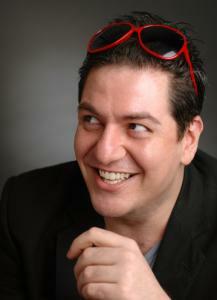 Mehran Khaghani is part of the Greater Boston Alternative Comedy group. No one on the current Boston comedy scene fills a room with personality quite like Mehran Khaghani. Broad-shouldered, sunglasses pinning back his thick black hair, his voice cuts through a crowd with a flurry of inappropriate observations, often directed at himself as a gay Iranian comic. It wouldn't matter if he were onstage with no mike - it would be impossible not to pay attention to him. "I've always had a pretty big personality," says Khaghani, who plays Pride Weekend at Mottley's Comedy Club tonight and tomorrow. "So it wasn't like I ever had the option of not sticking out." Khaghani, 33, has always stuck out for a variety of reasons. There was no problem when his family first moved to Winchester from Tabriz, Iran, when he was 3. He was popular, sitting at the "smart kid" table in school. But his family moved back to Iran temporarily when he was 9, during the height of the Iran-Iraq war. When they returned to Boston two years later, things had changed. "The same kids who were my best friends and who held me in high regard were like, 'How's the ayatollah?' " he says. "I didn't fit in, and they were mean about it." His first attempts at expressing himself as gay didn't help matters. He remembers one incident when he was 11 years old that ended with a boy's threat to tell Khaghani's parents he was gay and thoughts of suicide that followed. Coming out to his parents when he was 15 was "ugly," he says, but not without humor. "I said I was bisexual," he says with a big laugh. "I think I was trying to ease them into it. OK, step one, tell them I like boys, too. Step two, never marry." His sense of humor in dark situations helped him during his time in Iran, as well, when his city was being bombed, including his school and a local power plant he watched explode. "When we were getting hit really hard I could make eye contact with my mom and there was an understanding of the absurdity of whatever we were surrounded by," he says. "And that's funny." Tackling comedy clubs was comparatively easy. Less than two years after taking a local adult education course to get started, Khaghani has entrenched himself in the Boston scene. He's one of the most visible comedians in the crew Robby Roadsteamer put together under the Greater Boston Alternative Comedy banner. He was strong enough at the first Greater Boston Alternative show in December to secure an opening slot for fellow Iranian comic Maz Jobrani at the Berklee Performance Center. Jobrani says that Khaghani was a bit edgy for his crowd but tapped him to open for him again in Washington, D.C., and saw how quickly he could adapt. "He grew and was even better at easing into anything edgy," Jobrani says of the performance. "He came up with some very funny observations that I hadn't heard him do before in Boston, and I was just beaming backstage. I was rooting for him." Khaghani is constantly working onstage, at open mikes and on showcase shows, expanding his repertoire beyond his early jokes about being gay and Iranian. "I think as I've grown as a comedian I've gotten better at doing that in shorthand," he says. "But in the beginning all seven minutes was that - 'I'm a gay Iranian, and here's a joke about that.' "
Is he surprised at how far he's come so quickly? "Am I surprised?" he answers. "I mean, I'm funny. [Laughs] And I'm secure in that, I'm grounded in that, that I am funny. And people have been very, very generous with me." MEHRAN KHAGHANI At: Mottley's Comedy Club with Erin Judge, Jess Sutich, Ellen Moschetto, and Greg Rodrigues. 21+. Tonight and tomorrow at 8 p.m. Tickets are $20 at 877-615-2844 or www.mottleyscomedy.com.